What To Wear This Winter When You’re Feelin’ Kinda Horny. Scottish knitter Anne-Marie Dunbar‘s designs border on the utterly bizarre. They range from webbed claw gloves to a knitted model of the acrylonitrile molecule and beyond. is entirely seamless – the ears are worked by picking up stitches, and there’s a little grafting at the front – instructions for which are given in the pattern. Plus, I just had this thought: Though Dunbar has strived for a…er…naturalistic appearance in the piece, this being yarn, you can color yours in any hues you want. Orange face with teal horns and nose, Dolphins fans? 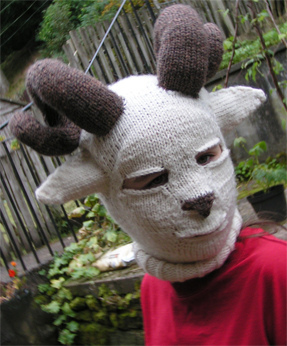 So, sign up to Ravelry.com, order the pattern for $5, pay via Paypal, and knit one up for the Aries in your life. Just remind ‘em not to wear it on their next SWAT call. You’ll see mine when I knit it up this winter!